ATLANTA—There was cause for celebration at the annual Hunter Hotel Conference, held here at the Atlanta Marriott Marquis, as organizers and attendees of the national owners’ investment event marked its 30th anniversary. 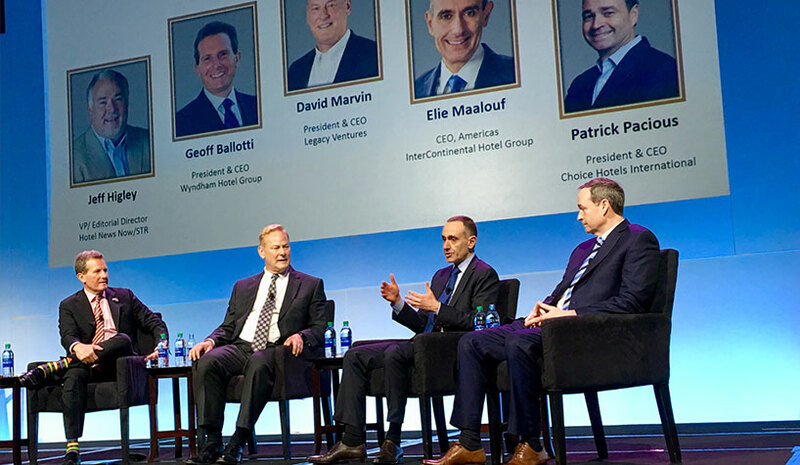 The festive tone of the day also brought moments of laughter as Wyndham Hotel Group President/CEO Geoff Ballotti—referring to the company’s in-progress acquisition of the La Quinta franchise and management business for roughly $1.95 billion—handed out La Quinta-branded “power” socks during the Presidents’ Panel to fellow speakers on stage. He was beaming with pride. When asked what made the brand attractive, Ballotti touted La Quinta as consistent and one that franchisees love. The conversation moved from this one particular brand to the question of brand proliferation. How much is too many for a franchisor? “There’s probably some point of diminishing returns, but I don’t think it necessarily comes at the brand level,” said Pat Pacious, president/CEO, Choice Hotels International. “When you look at a certain market, what’s the percentage of inventory that’s out there that’s actually sitting on one hotel platform? When moving into a market with a new brand, how many additional Choice hotels are in that market? Does it make sense for us to add another brand in that marketplace? We’re sitting at 12 brands today and we don’t see a lot of market saturation where we are, but there are opportunities that if you do get too big, and you’re at 30 or 40 brands, you start acting like an OTA,” he said. Turning to talk about the guest experience, David Marvin, president/CEO of Legacy Ventures, said it’s been a key focus in his business. “It’s been a key driver toward developing the F&B area and becoming active on a full-service basis. Increasingly, baby boomers want experiential travel and they’re not alone, so we’re spending time creating unique experiences,” said Marvin. While more people are traveling across the board, it’s the 55 and older crowd that is leading the pack. They represent the greatest share of households (50%) and they’re spending, according to research shared from Tourism Economics. As hoteliers talked positively about the strength of the economy, the Federal Reserve hiked interest rates from 1.5% to 1.75%—the highest level since 2008—and there are at least two more increases forecast.